The submarine G9 (Lieutenant Commander the Honorable Byron Plantagenet Cary DSO) is on patrol between 60 degrees 30 minutes north and 61 degrees 30 minutes north off the coast of Norway. It is a very dark night and G9 is aware that an enemy submarine is in the vicinity. There is heavy rain with heavy seas and wind force 4-5. While on the surface, G9 fires a torpedo at the destroyer HMS Paisley after mistaking her for the German U-boat. The torpedo fails to explode and the destroyer rams the submarine. A stoker named Drake is the only survivor while thirty-three are killed. The commanding officer of Paisley has received no instructions regarding probable presence of British submarines in this area. The subsequent Court of Enquiry will attribute no blame to Paisley. Commander Cary is the son of the 12th Viscount Falkland and dies at age 30. Enemy counter attacks north of Inverness Copse are repulsed while they also attempt to advance north of Langemarck after a heavy bombardment. Successful raids are carried out by the British on the Arras front between Cambrai and St Quentin. Lieutenant Robert Lynedoch Graham (Royal Field Artillery attached Royal Flying Corps) is killed at age 21 when his Spad is shot down southwest of Passchendaele. He is the son of ‘Sir’ Thomas Lynedoch and Lady Graham Judge President of the Eastern District Courts Grahamstown South Africa. ­­­­­­­­­­­­­­­­­­­He was educated at St. Andrew’s College, Grahamstown, and at Clare College, Cambridge, where he was an undergraduate when war was declared. Volunteering in January 1915, he received a commission in the Royal Field Artillery and went to France in the following May. 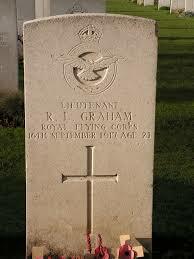 In 1916 he transferred to the Royal Flying Corps and was severely wounded in April. He was reported missing until a message dropped by German airmen on Christmas Day stated that he had been killed today. Lance Corporal Holroyd Edward Hamlyn (Somerset Light Infantry) is killed in action at age 22. He is the middle of three brothers who are killed in the war. Gunner Alfred Thorley (Royal Field Artillery) dies of wounds at home at age 35. His brother was killed in July 1916.